Dzhokhar Tsarnaev manhunt: Can suspects evade cops by listening to police scanners? Can Suspects Evade the Cops by Listening to a Police Scanner? In the breakneck quest for up-to-the-minute news on the Boston bombings, a growing number of news-watchers have been listening in to online police scanners like this one in order to keep tabs on the investigation. By Friday afternoon, as the search for suspect Dzhokhar Tsarnaev continued, three free police-scanner apps had cracked the top 10 most-downloaded list on iTunes. The scanners promise access to the radio channels that officers use to communicate with one another in the course of their work. It’s understandable, then, that the Boston Police Department tweeted a plea to the public to stop broadcasting tactical information gleaned from the scanners. But that raises a question: What’s to stop suspects themselves from tuning in and using the information to stay a step ahead of the law? Nothing—and savvy criminals often do just that. But, as local reporters have long known and Twitter enthusiasts are beginning to discover, the information transmitted over the publicly available channels isn’t necessarily all that useful. Practices vary from one department to the next, and it’s unclear exactly how all the agencies involved in the Boston manhunt are staying in touch. But in general, the radios that police carry with them can be tuned to several different frequencies, each with a separate purpose. One that’s typically unencrypted is the primary dispatch channel, through which dispatchers at a central communications office communicate directly with officers in the field. Occasionally important information will be transmitted over that channel, as when an officer calls in the location or license plate number of a suspicious-looking vehicle. That’s why Boston police would prefer that people didn’t live-tweet the scanners, as many have taken to doing. And on plenty of occasions, the leads turn out to be false, which is why good journalists avoid reporting anything heard on the scanner until they can verify it independently. 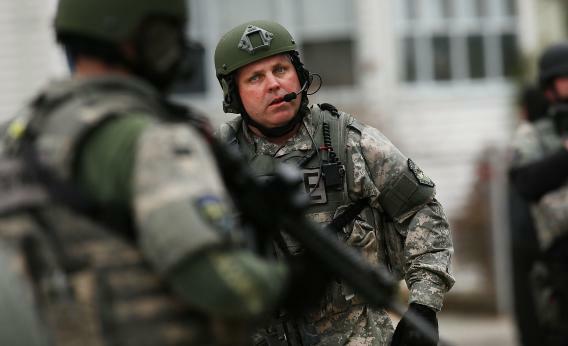 But for special operations, including SWAT activities, the officers involved usually switch to a tactical channel. Often this channel is scrambled, so that anyone trying to listen in without authorization will hear only noise. “If a suspect is heading to 123 Second Ave., they’re not going to be putting that over the regular general frequency, because they know that if the bad guy’s listening to it, he’s going to get out of there real quick.” says Joe Pollini, an ex-New York police officer and professor at John Jay College of Criminal Justice. Some SWAT teams have switched off of radio entirely, communicating instead by cellphone. The downside to these special channels, for the police, is that they make it hard to share information among different agencies in the case of a big investigation like the Boston manhunt. Experts say it’s likely that most of the tactical information in Boston today is being shared on encrypted FBI channels, with bureau agents teaming up with local officers to ensure everyone’s on the same page. So if the remaining at-large suspect is carrying around a scanner, there’s a good chance he’s wasting his time.